There are so many cool things you can do with fungi on a home or neighborhood scale to deal with your household waste, to grow food and medicine, to break down toxic stuff in your life (mycoremediation), to build healthy soil, boost your garden, and more. The workshops I offer (see https://diyfungi.wordpress.com/workshops-and-events) walk through this stuff in greater detail and hands-on, so you are supported in doing it yourself (or better, together)! I also sell mushroom spawn in different forms so you can try this stuff out! These are some basic handouts and information on ways to grow different mushrooms. Click on the link to download the file. The easiest way to get started growing mushrooms in my opinion is to grow Oyster Mushrooms on spent coffee grounds! You can incorporate mushrooms into your garden or site to boost food and medicine production in spaces you otherwise couldn’t grow in and build healthy soil ecosystems to support plant well-being. In Victoria where I live, garbage was dumped in James Bay until 1892; until 1955 it was loaded onto barges and dumped 2 miles out of the harbor, until 1970 it was burned and dumped along millstream, and its only since the 70’s that its been going to Hartland landfill. We produce so many non-biodegradable item with short shelf lives and long term impacts. In the Capital Regional District, guess what makes up most of what goes to the landfill? The most frequently encountered waste component was “Organic Waste” accounting for one third of all residuals. Second was “Paper and Paper Products” representing approximately 16% of the total waste stream. Third was “Plastics”, representing about 13% and the fourth most commonly found waste type was “Wood and Wood Products” at 10%. The remaining waste categories represented approximately 30% of the waste stream. In terms of the waste disposal rates, it was calculated that each person within the Regional District was responsible for 414 kg of landfilled waste in 2009. Included in this total was 126 kg of “Organic Waste”, 69 kg of “Paper and Paper Products”, 54 kg of “Plastics” and 41 kg of “Wood and Wood Products”. What do mushrooms eat again? Paper and Paper Products, Wood and Wood Products for sure, and organic waste can be composted and secondary decomposer mushrooms grown on it. That means that at least 26-59% of what ends up in our landfill is suitable to grow mushrooms on (to recycle or compost with mushrooms). 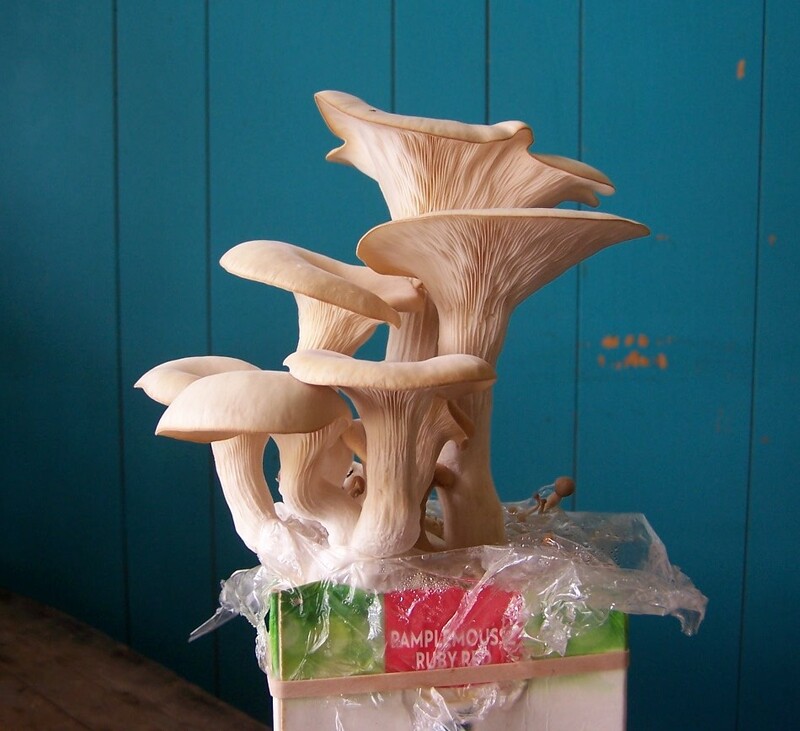 So… you can grow mushrooms on waste materials for food, or you can work with fungi to break down a household or community waste that you want to address. To get started, identify your biodegradable waste. You can separate your weekly garbage and see how much cardboard, paper, plastics, food scraps you are generating. This will help you determine where you can improve purchasing, pretend that landfills don’t exist! If you have a cat or dog, you can experiment with digesting their poop with mushrooms. This is an experiment, and I initially propose Oyster and King Stropharia mushrooms based on what research suggests. Though, in my own digesters, I keep seeing Coprinus species (the family that Shaggy Manes are in) popping up, and this makes sense- they are secondary decomposers, and break down whats already been broken down by animals and other life. I think Coprinus species would be good to explore for these digesters too!